Optimize your keywords to help get a guaranteed search engine ranking! Trust is like a sheet of paper, it can’t be taken back to its original form once it’s been crumpled. The saying quite suits the companies who are willing to get a huge number of customers online through their respective websites. As the likelihood of a customer visiting a website depends a lot on their view of the trustworthiness of the website. Most people tend to give their orders and business to the first few names on listed on the Search Engine Results Pages. A good ranking in the various search engines can help your website to get that reputation. It enhances the chances of getting an order as the number of customers visiting your website hugely increases with a good ranking for your website. The search engine optimization has been a boon for achieving a guaranteed page ranking on search engine results page. 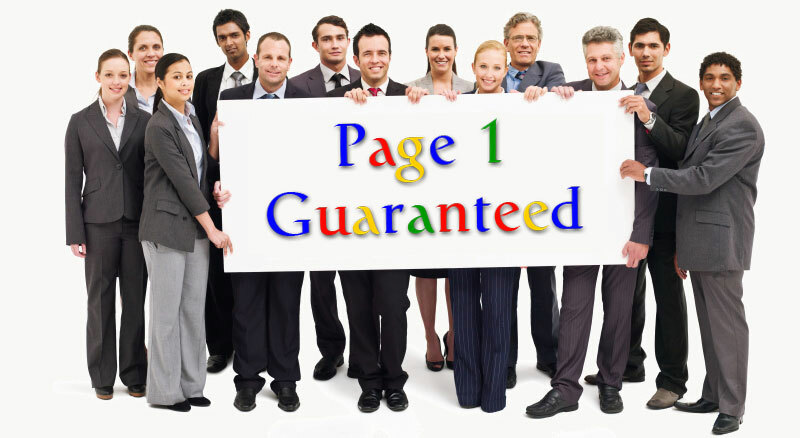 There are some companies who claim to offer a guaranteed page 1 ranking through their quality SEO services. To get one of the top rankings on the results page, you must know how the various search engines find your website for a specific product or service. The first thing you need to know about search engines is that they aren’t human. Unlike us, they are just text driven. However the technology is advancing with high-speed, however they are far from being truly intelligent, they can’t enjoy the sounds and movements in a video or witness the beauty of an image with an appealing design. These search engines crawl the web to see what text a website contains. The activity is done by a piece of software called a crawler or spider of a search engine, for example Google uses Googlebot for this purpose. The links are followed from one to another by these crawlers and everything that they come across on their journey is indexed. All that a crawler indexes are the keywords, the most important item in SEO ranking. The search strings are matched against these keywords only to provide a SEO ranking for relevant pages. Thus, the first and most crucial step is to choose the right keywords for a guaranteed seo ranking. The task is sure to be very tough if you fail to recognize the right keywords to optimize for. Usually these keywords are listed after a thorough analysis of what the online population is looking for and what your competitors are using too. A few years ago, the one-word search strings were enough to top the results of a search engine. But, today the web is extremely populated with one-word search strings so you need to go for two-word search strings or three-word search strings is a more realistic objective. Go for two-word or three-word search strings that can describe your website in the best way. As the crawlers of different search engines index the pages in different ways, you need to know the important factors for different search engines for a guaranteed seo ranking. While the Google uses the GET method of optimization, Bing places more emphasis on the keywords being used in URL’s and prefers the pages from larger sites. Get to know the pillars of a successful SEO campaign! Seeing their company’s website in the top search results of search engines is on the wish list of every online marketing company. Not only does it secure your position in comparison to your competitors, but also it gets you a significantly number of orders. A large percentage of customers go for the names that at the top of the results and through better seo you can take advantages of this fact. But just having money isn’t going to help you as these page rankings aren’t for sale. You are supposed to understand the main components of a successful seo campaign in order to get a guaranteed search engine ranking. By knowing how a successful seo campaign is planned, you can get your website ranked in the top results of search engines. Your website should follow a few rules and algorithms to get guaranteed seo results. Here I am going to tell you about those few important factors that make your website top the search engine results. With Google’s new Panda and Penguin algorithms, many old popular tactics don’t work anymore. These algorithms have forced the online marketing strategists to think about their current seo tactics and to give more attention to quality content publication. But content strategy is a little more than just posting good content. Besides, the posted content relating to the website, it should include optimization from a technical seo point of view. After getting the technical terms covered, you have to focus on the content publishing strategy. Yes, I am talking about the research to find the right keywords. You are hopefully pretty well placed to understand your target market and the right keywords that the online population is searching for. Another good thing about keywords is that they make your site's content complete. Check whether people in your target market are looking for an article or blog post with such keywords and they can’t find them? If yes, then go and create a blog post or an article about it now. The hyperlinks are created from other websites to your own in a link building process and they introduce the external readers to the content of your website. The quality and quantity of the links also matters a lot to organic search ranking algorithms. Moreover, the guest blogging has been a great way for building inbound links and it’s very popular nowadays. But, when it comes to smarter search engine algorithms, the quality always trumps the quantity to guarantee page 1 ranking. Today, most of the seo strategists have taken extra time to understand the influence of social media for organic search marketing strategy; the community is accepting it as the third pillar for effective seo campaigns. More than keeping your company up with the competition, it also provides an additional platform to interact with the customers and create a community. Of course, it requires a bit of a different strategy for each company and every company needs to find where their target audience is hanging out online. Hence, it’s not too tough to focus on one or two of these factors and get guaranteed seo results.